My husband has recently become obsessed with baked good, specifically baked goods that he grew up eating in Guinea-Bissau. He’s constantly looking up recipes and sending them to me – he’s the chef, I’m the baker haha. This specific cake he wanted a lemon flavour and I got the idea to use some lemon oil and the results were phenomenal. This cake doesn’t NEED the oil but if you have it you should definitely use it because it takes it from good to amazing! Let me know if you try it! 1. Prepare a cake pan (we used a fluted tube cake pan) with oil and dusted with flour. Preheat oven to 350 degrees. 2. Beat eggs and sugar for 3 minutes. 4. Sift flour and baking soda into mixture and mix with wooden spoon until incorporated. 5. Pour into prepared pan and bake for approximately 30 minutes or until a toothpick inserted comes out clean. 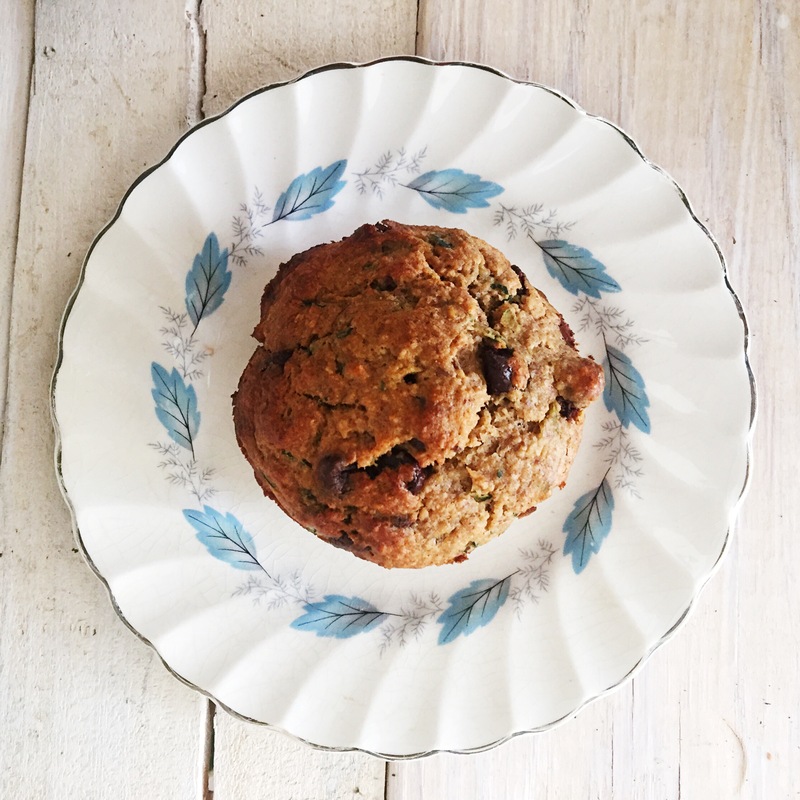 I like to double this recipe and love it with some whipped cream! Recently Young Living got the go ahead in Canada to label a select few of their essential oils as food grade. Though in the US they have been able to label them this way for quite a while. This opens up so many more possibilities on how to use the oils! Though the label is different the actual oil inside the bottle is the exact same so if you have the oil from before you can still use them this way. I’ve been on a chocolate kick lately and have seen several versions of this recipe floating around the Internet. It’s not my first time making chocolate, but I normally use cocoa butter and cacao etc. This time I just wanted a fast and easy recipe and I thought it would be fun to try out some essential oils in it too. This took me less than the time it took to make a cup of tea – I know that because I made it while waiting for my tea to steep. I usually have a bag of this in the freezer and grab a piece or two whenever I’m craving chocolate (usually daily!). Melt chocolate and coconut oil together. I prefer to use the double boiler method but putting it in the microwave in 30 second increments and stirring after each time also works. Once melted add the peppermint oil to taste. I love lots of peppermint flavour so I added 4 drops. Line a cookie sheet with wax or parchment paper. Pour out the chocolate and spread with a spatula. Top with almonds and sea salt if you want. 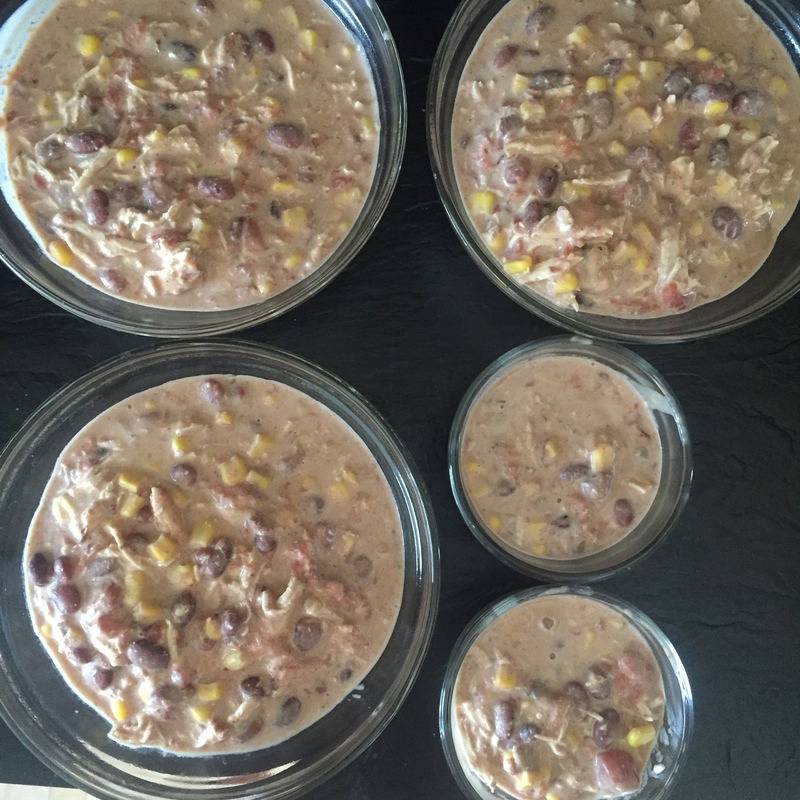 Put in freezer for 30 minutes. Take out break apart and EAT! My biggest gardening adventure this year was to be able to can enough tomatoes to get us through to next years harvest. I was able to harvest 136 lbs of tomatoes, and the majority of those were processed into tomato sauce and canned into jars. I did give some away and we ate some of them but mostly I spent A LOT of time in the kitchen processing the tomatoes. In the picture above you can see the second shelf is full of jars of tomatoes, and we have already used more than 10 jars of tomatoes, that’s a lot of jars! We chose to only can tomato sauce for a couple of reasons. First is that it’s just plain easier than blanching and peeling 136 lbs of tomatoes and then dicing them up and packing them in jars. Second because we aren’t too fussed about the texture of the tomatoes we cook with. With that decision made I experimented with three slightly different ways of making the sauce. Mill them raw then cook them down. I did this with probably over half of the tomatoes, and it works well but it wasn’t my favourite. Cut them up throw them in a pot to cook a bit and soften to make it easier to mill them. Then mill them and cook it down a bit more. This was the worst way ever, mainly because I burnt them and now have 7 jars of smoky tomato sauce. It works well in chilli but otherwise I don’t enjoy the smokiness. My favourite way is to cut them in half lay them skin side up on cookie sheets and roast them in the oven until the skins are charred. Next mill them into a sauce, depending on your preference and the types of tomatoes you use you may not need to cook the sauce down at all. I found this to make a nice, rich, thick tomato sauce and it was the easiest way I found. I did some other canning this year as well. Every year Heritage Park here in Calgary, AB has a Harvest Sale with 100% of the proceeds being donated to the Alberta Children’s Hospital Foundation. The produce is often marked down and so it’s a great affordable way to put food by for the winter months and I really love that all my money goes towards charity. I bought a box of apples and pears that were made into Apple Pear Sauce that my toddler takes in his lunches daily and loves. 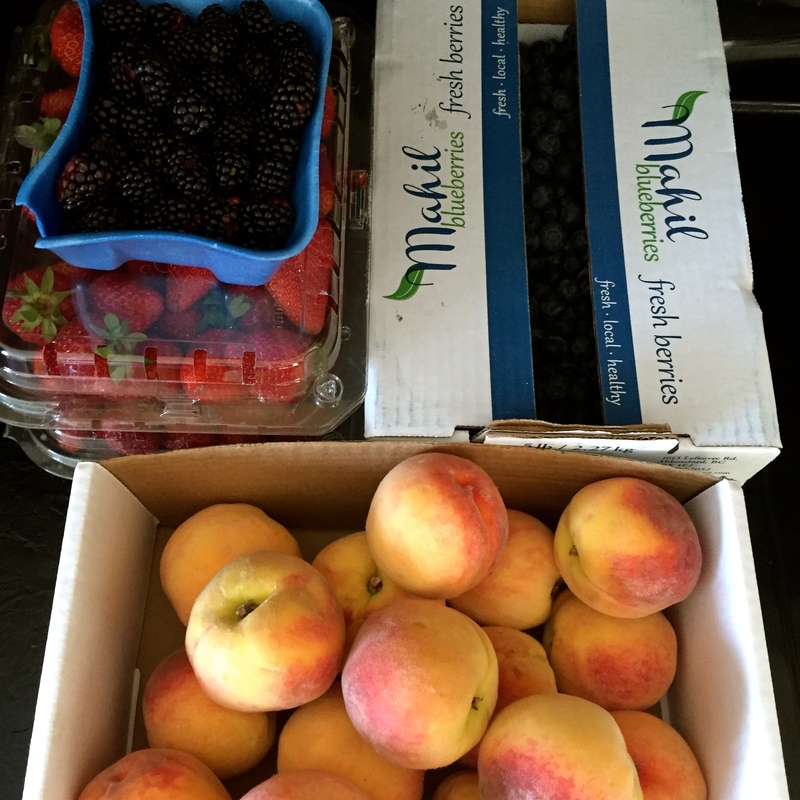 I also bought a box of peaches, they weren’t great peaches, in fact I couldn’t eat them as is but I did find an amazing recipe for Honey Peaches on the Food In Jars blog. The best part is that they don’t need to be peeled (are you sensing a laziness theme here?) and honestly, I am devouring them! I eat them almost daily with plain yogurt and granola. I also did a few jars of peaches packed in fruit juice but haven’t tried those yet. The last thing I canned this year (not pictured) are three large jars of pickled beets which I’m excited to dive into. It’s been a lot of work to put food into our pantry for the year, but honestly the feeling of providing for my family in this way is amazing. The tomatoes are obviously my pride and joy and I get happy just looking at that shelf of jars. Did you do any canning this year? I’d love to hear some new recipes, and if you ever want to try your hand at canning next year I highly recommend that peach recipe! It’s Saturday! 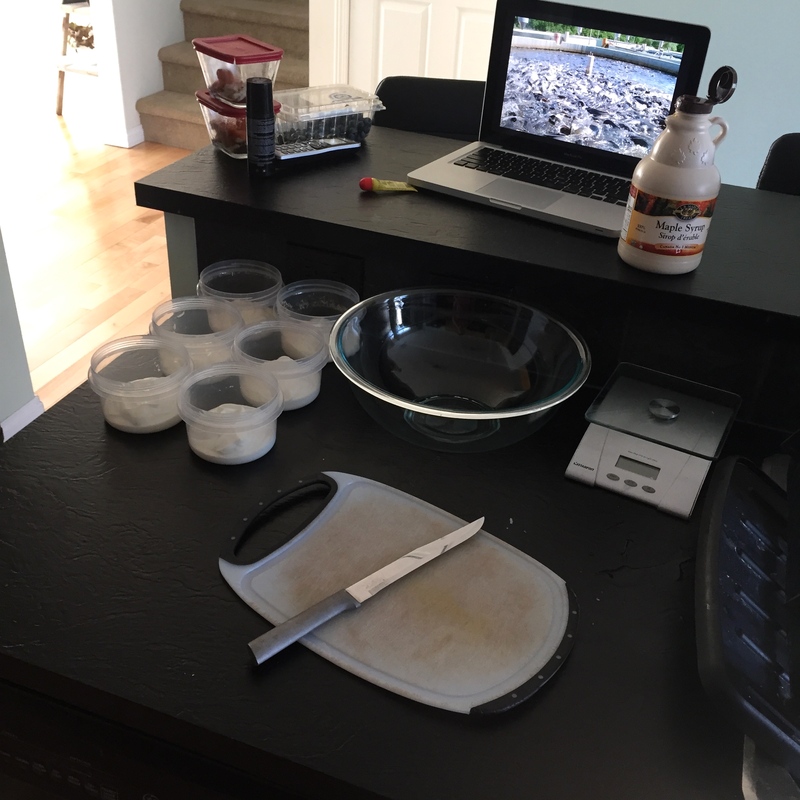 Which means it’s my food prep day! I’ve only done this for two weeks now. The first week was amazing, and I spoke briefly about how life changing it was here. This week was a bit different as I’ve been sick so I haven’t been eating very well at all, however, the amount of time I saved each night was still just as helpful! 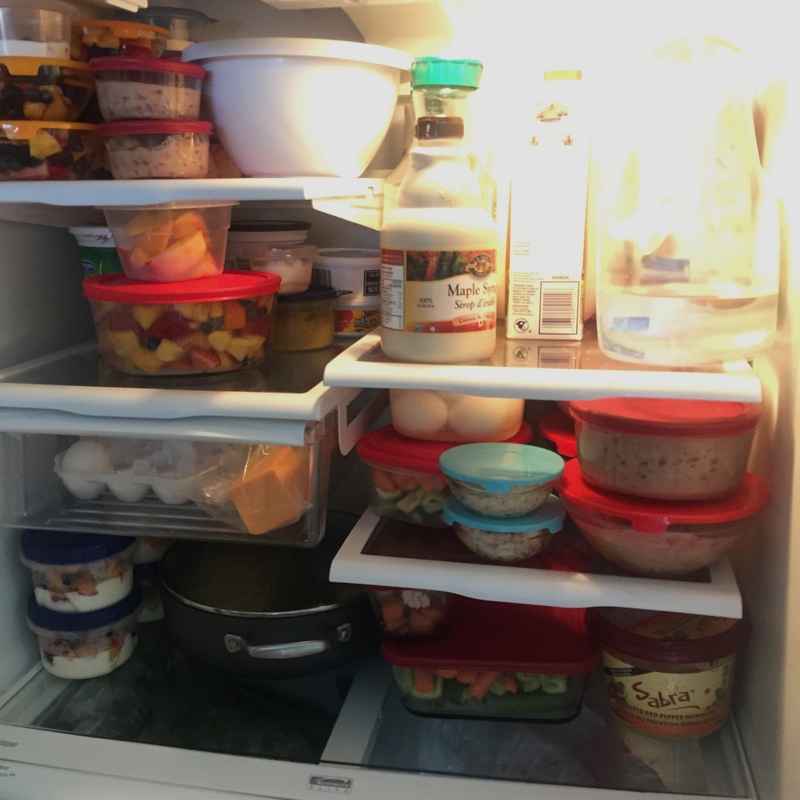 I thought today that I would walk you through last weeks food prep and comment a bit about what was good and what I could improve on based on how my week went. I usually sit down on Thursday and brainstorm what types of foods I’ll make for the next week. My general rules are: it has to be relatively quick to prepare and it needs to be healthy and nutritious. 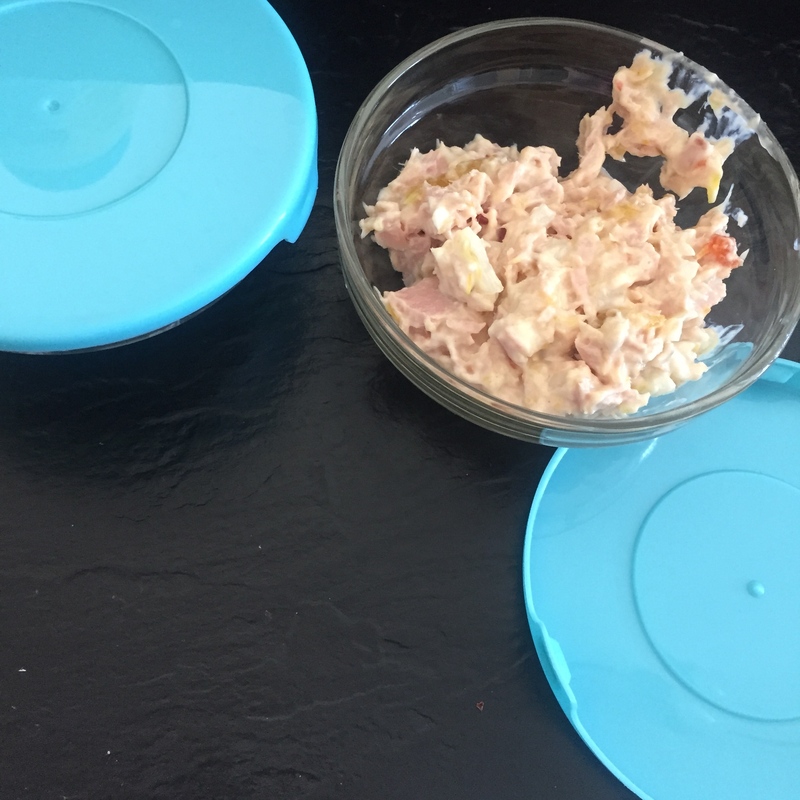 I do try to have some variety and the trickiest part is preparing food for my son because he can be super picky while at the dayhome, in the end I pack him generally the same breakfast and snacks each day that I know he really loves and I pack a variety of lunches which are always hit and miss. To be honest, usually my husbands food wins over mine when it comes to what Ezekiel will eat. After preparing a list of what I’ll make I then create a shopping list. I do my Superstore run on Friday evening after work for any dairy or packaged food (cereals, crackers mostly) and my Market run on Saturday morning with Ezekiel for all my produce. 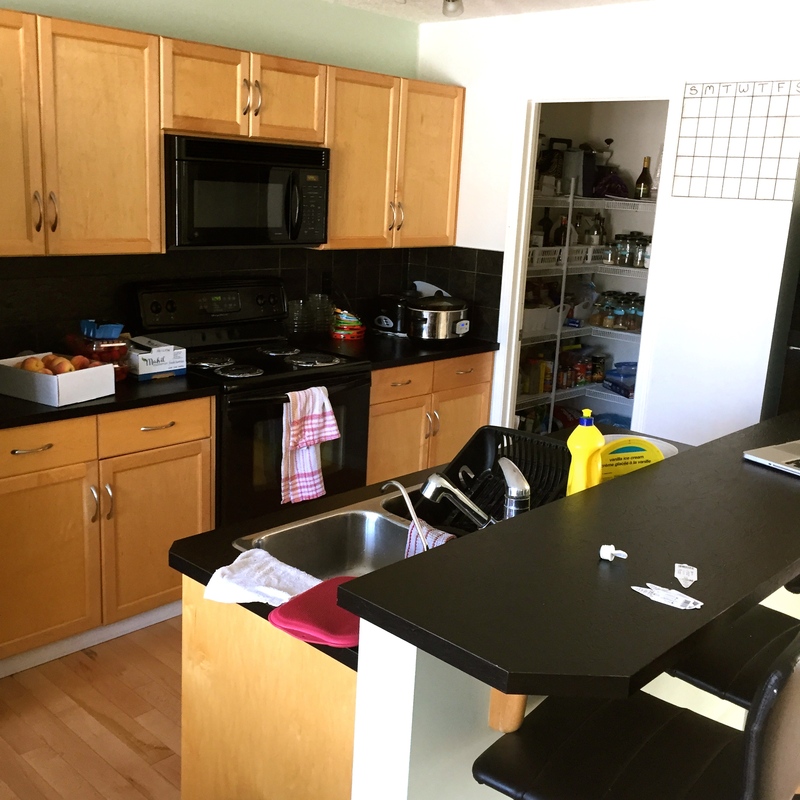 This is the size of my kitchen, not overly large and everything is pretty accessible and close. 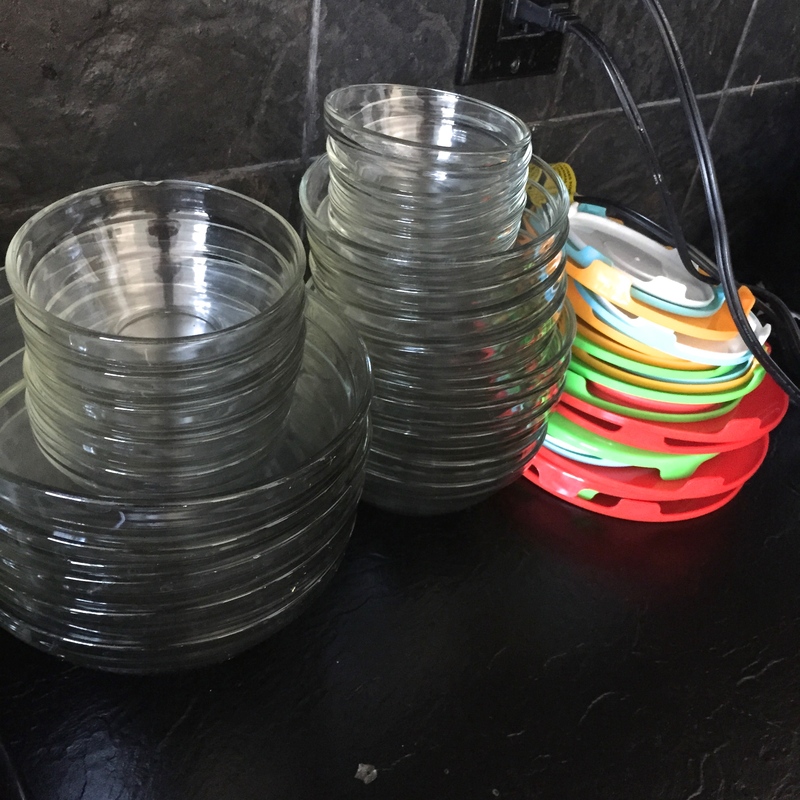 I do try to clean as I go so it’s not so overwhelming at the end of my prep time. Last week I set my timer to see how long it would take and it was about 2 hours and 15 minutes. For anything that needs to be heated I use glass containers, for anything else I’m ok with using plastic. 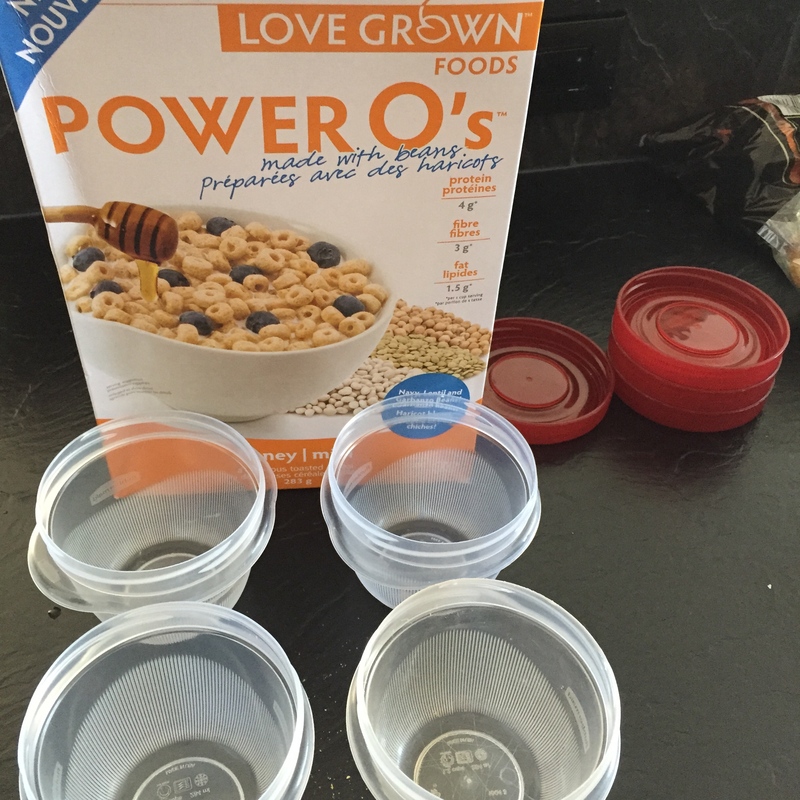 It’s a bit tricky strategizing what food will go in what container, by the end I have almost run out of containers. 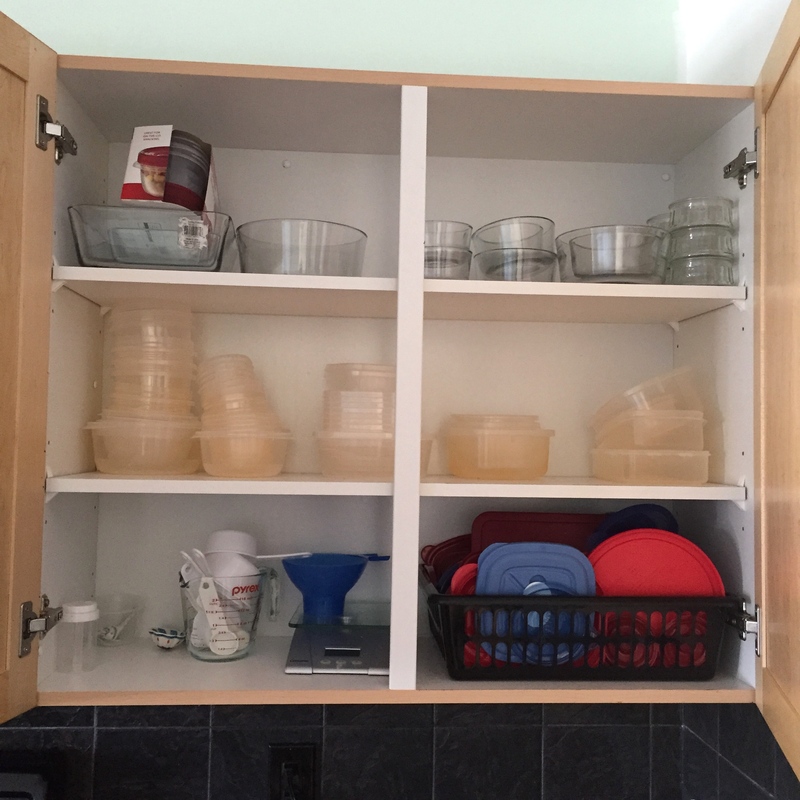 It really helps to be organized with your containers, I never have to search for lids or containers which speeds up the process considerably. Last week I used maple syrup. 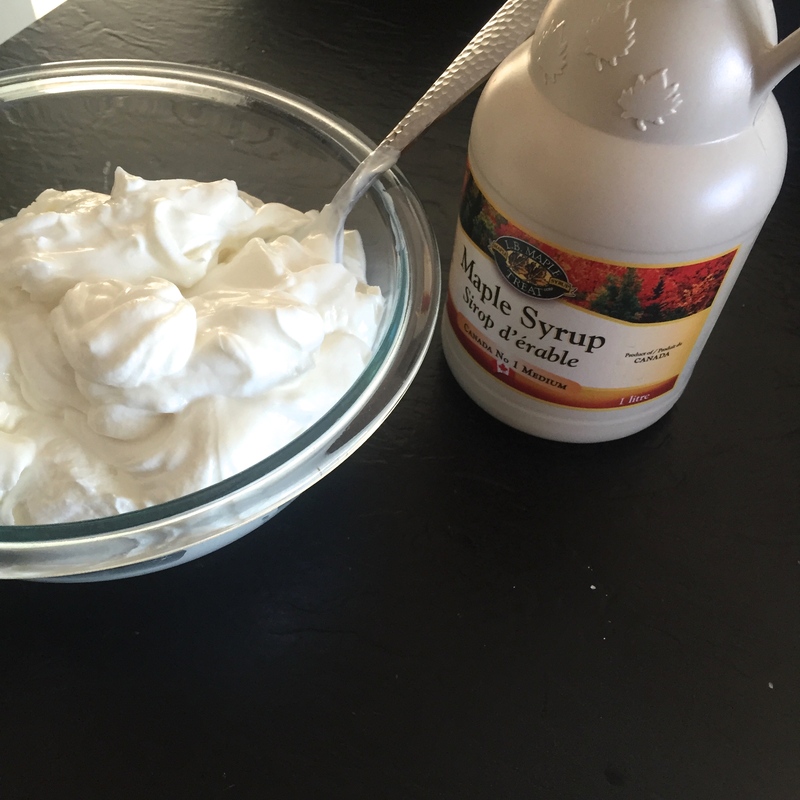 I put the entire container of yogurt in a bowl and mixed in about 2.5 Tbsp maple syrup. 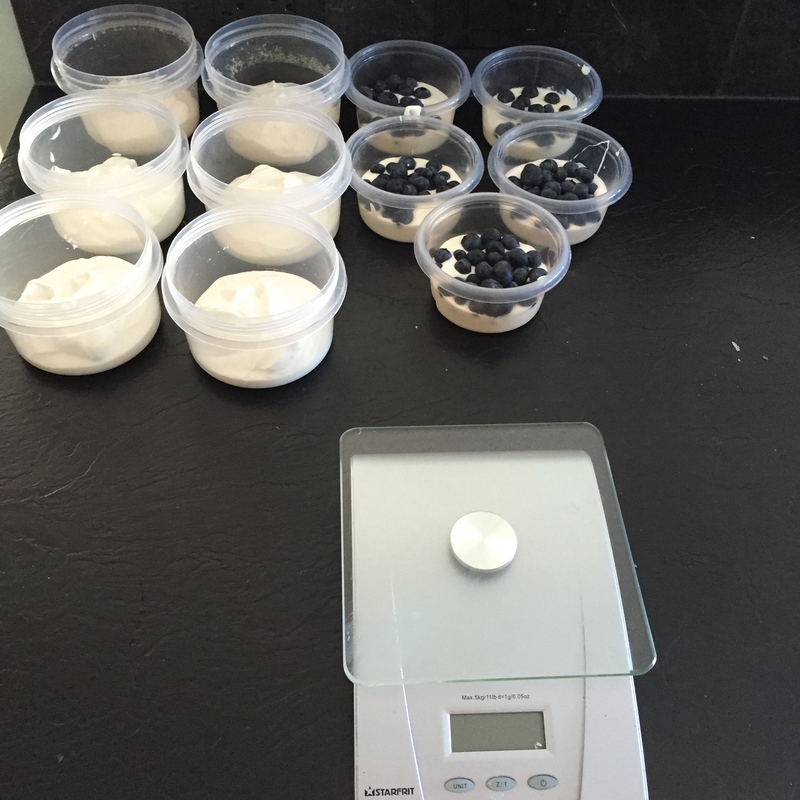 I measured out the yogurt into individual portions – 6 for me and 5 for Ezekiel. For Ezekiel I added some blueberries. This was my loot from the market last week. It was an incredible deal and I couldn’t resist it. 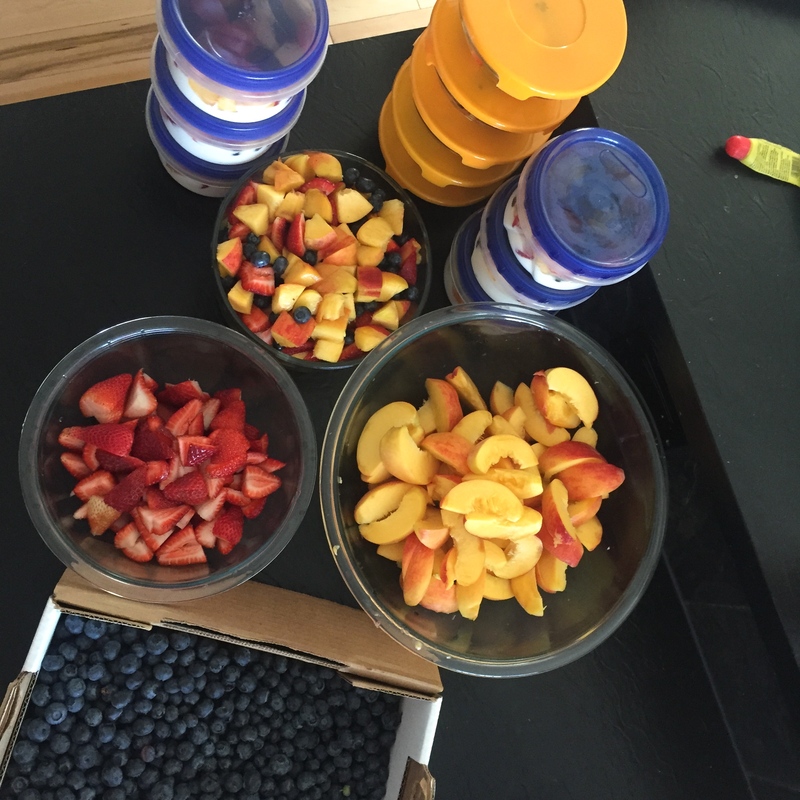 I ended up making a bunch of fruit salad and then freezing the rest. I should have frozen the majority of it. The problem was that the fruit was ripe on the verge of overripe so when I made the salad it ended up going bad by Wednesday. I watch Netflix as I do this to keep me company. 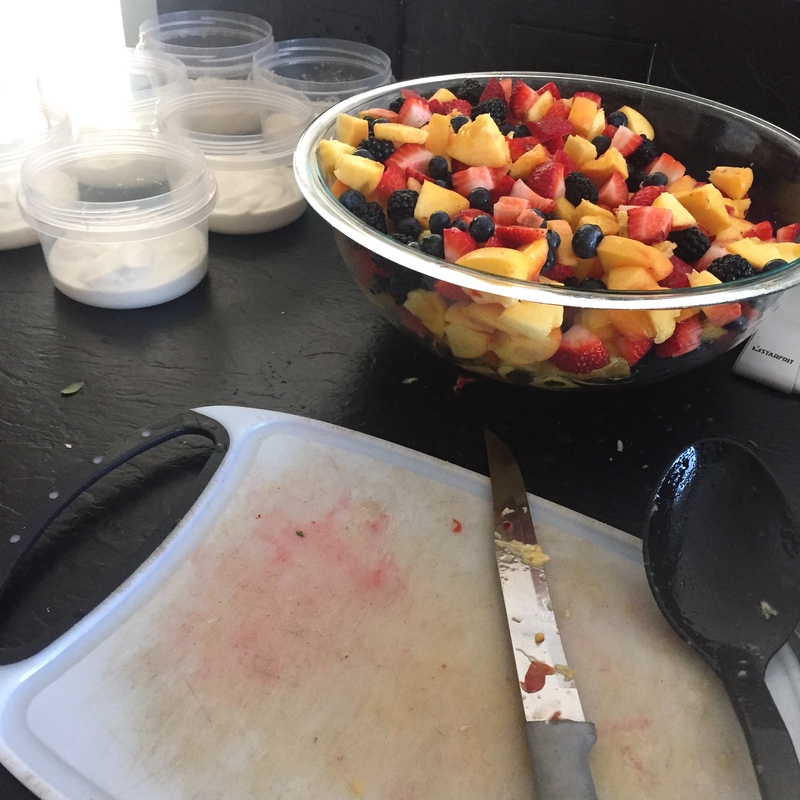 The biggest problem was that I added the fruit salad to my yogurt which means I wasted far too much food. Lesson learned. 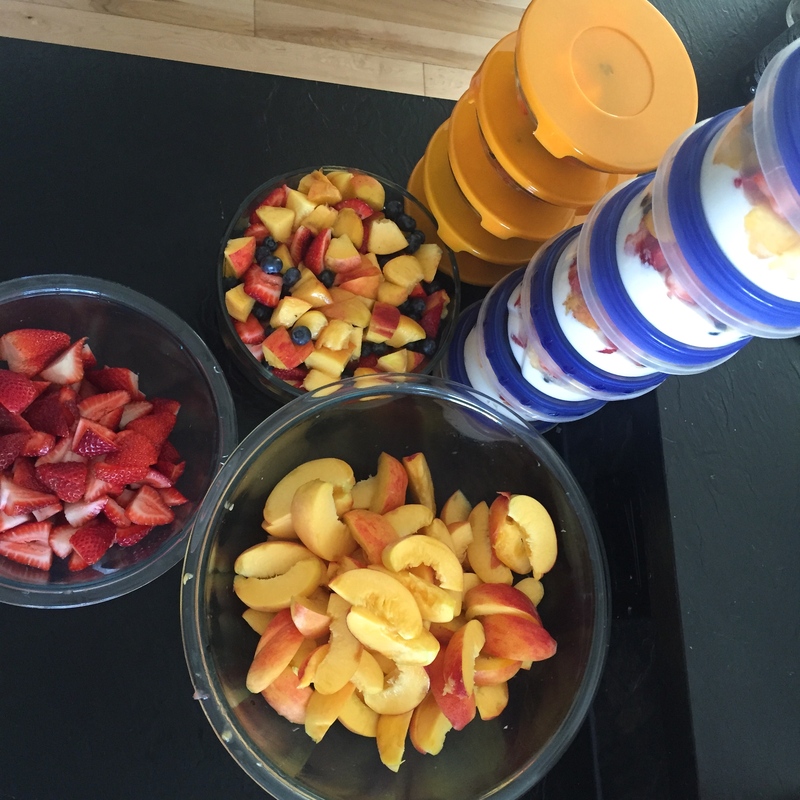 The frozen fruit has been really great for smoothies each morning, Ezekiel and I have been loving them. One of Ezekiel’s favourite snacks is cheese and crackers. I also send cereal each day. This is my favourite brand for Ezekiel, it’s got great ingredients and is far more nutritious than regular cheerios. 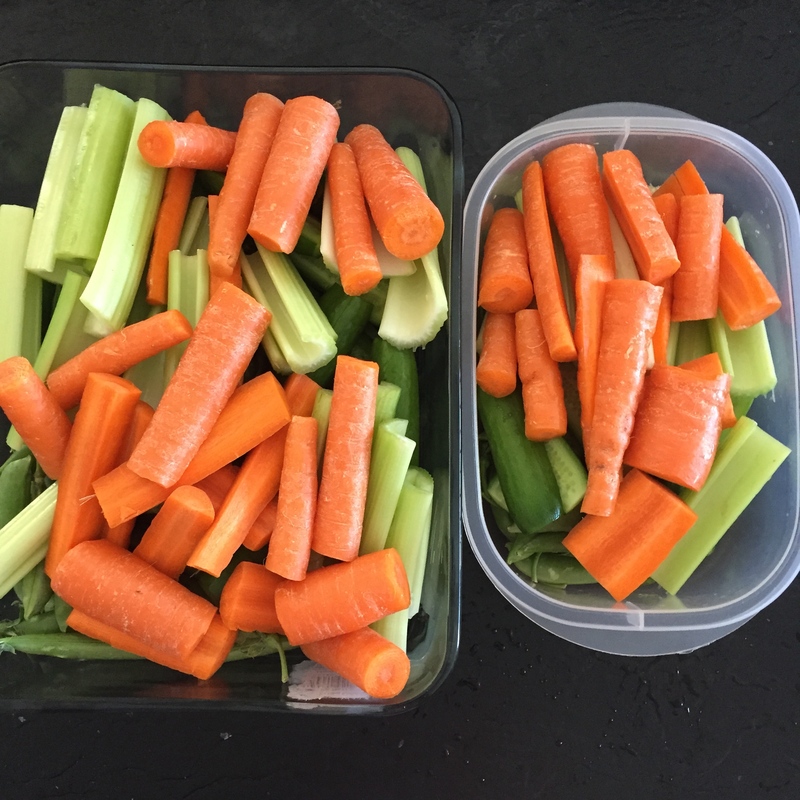 Cut up veggies has been amazing for lunches and to snack on at home. Even Ezekiel loves snacking on veggies. 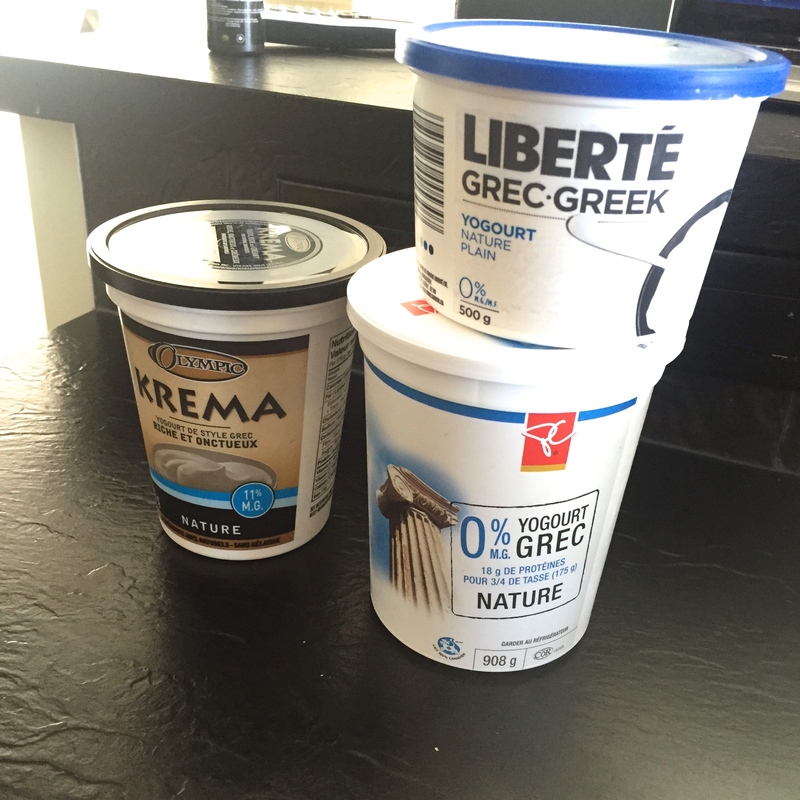 I pack a big container (on the right) and then I can eat as much as I want, I just keep bringing the same container each day and I bring a dip as well. I have wasted far less veggies doing this because I don’t get lazy and they are ready to eat so no more prep needed! 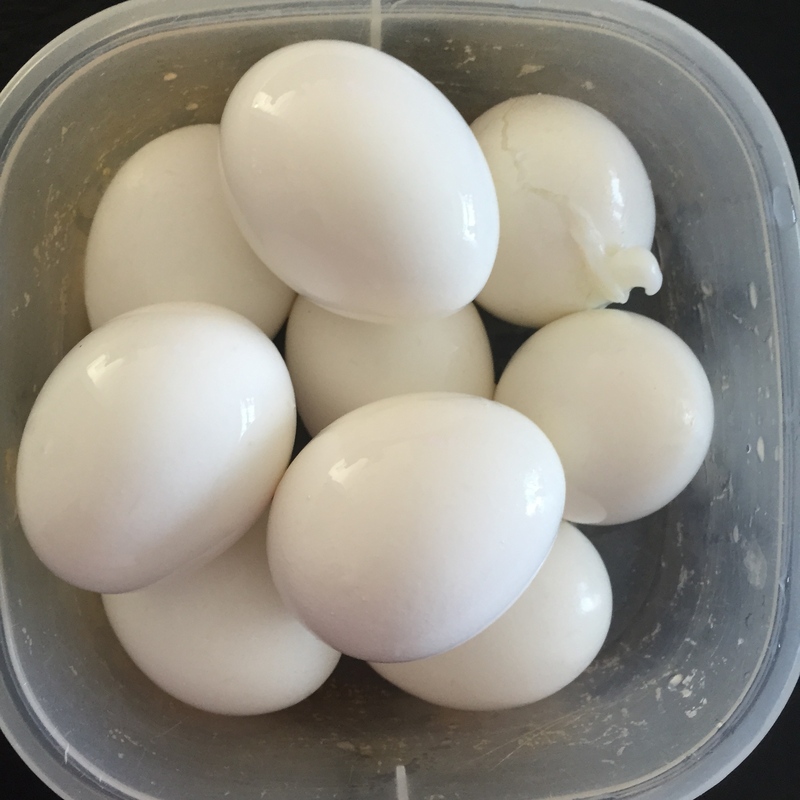 Boiled eggs are easy and fast to grab and go, and super healthy! 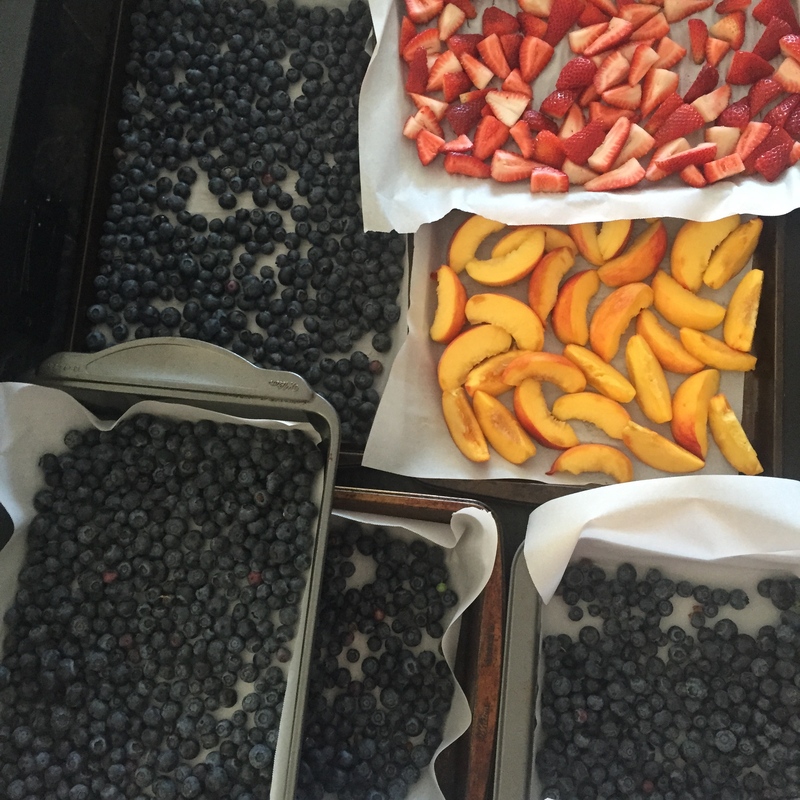 This is how I prepared the fruit to freeze, then when they were completely frozen I put them into ziplock bags. When you do it this way they won’t stick together in the bags. That’s it! 2 hours of work that saved me at least 1 hour each night! I don’t think I’ll ever go back. Do you have any meal prep tips? I’m always looking for easier more efficient ways to do things. This past week I’ve made what could possibly be one of the biggest life game changers for me. I’m actually astounded at what a huge difference this little change has made to my life. The crazy thing is it’s not a new concept, it’s not something I haven’t tried before, but this last time of trying it has been exactly what I needed. 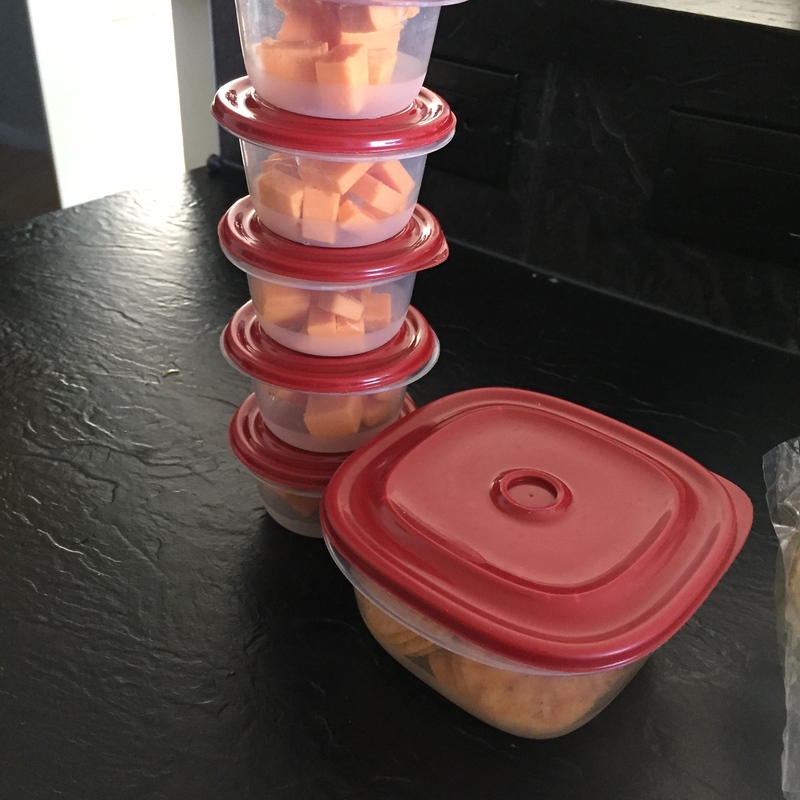 I started doing food prep. That’s it! I know, not earth shattering for most people. If you’ve been here for a while you’ll recall when I started doing some food prep before going back to work after maternity leave. Well I went back into shift work and for the last 7 months I haven’t been doing shift work, I’ve been doing Monday – Friday 8-430 and then Sunday’s 7-7. I thought being home every evening would give me plenty of time to prep food each night for Ezekiel and my lunches. What actually ended up playing out is that I would get home, try and prepare supper with an incredibly “hangry” toddler at my feet. After finally getting some food into him I would march him upstairs we’d play for a few minutes while he bathed and then he was off to bed. I’d come downstairs, run the diapers through a rinse cycle, clean up supper, and then prepare lunches. After the lunches were prepared I’d do any little extra tasks that were needing to be done – water the garden, mow the grass, sweep the floor, clean a bathroom etc. When all was said and done I was falling into bed at 930 never having a moment to sit and relax, it was always go go go go go, and I was so exhausted all the time. 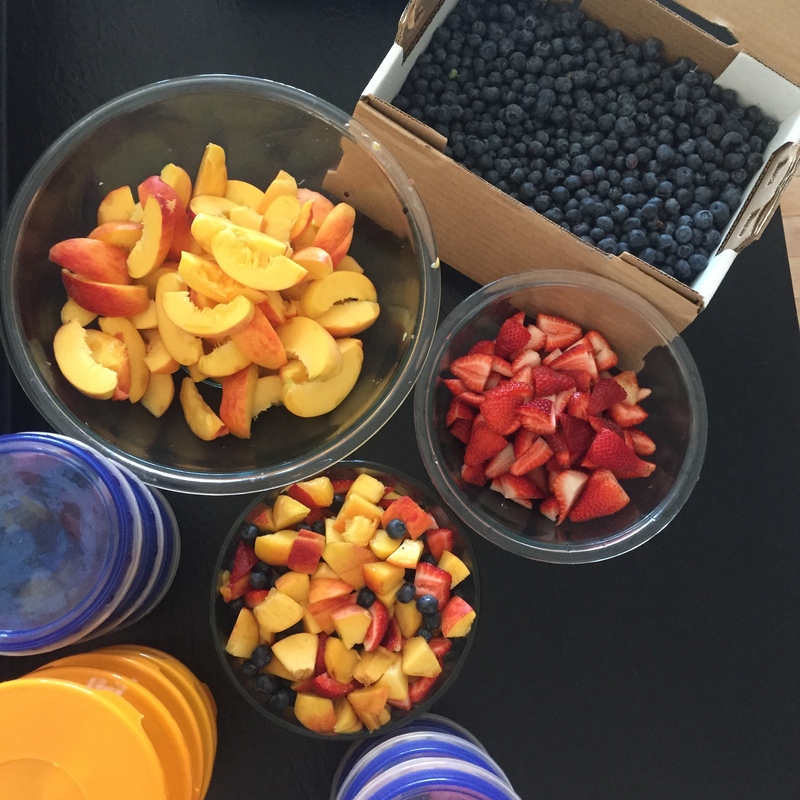 So last Saturday I spent Ezekiel’s nap prepping and dividing food for our lunches. 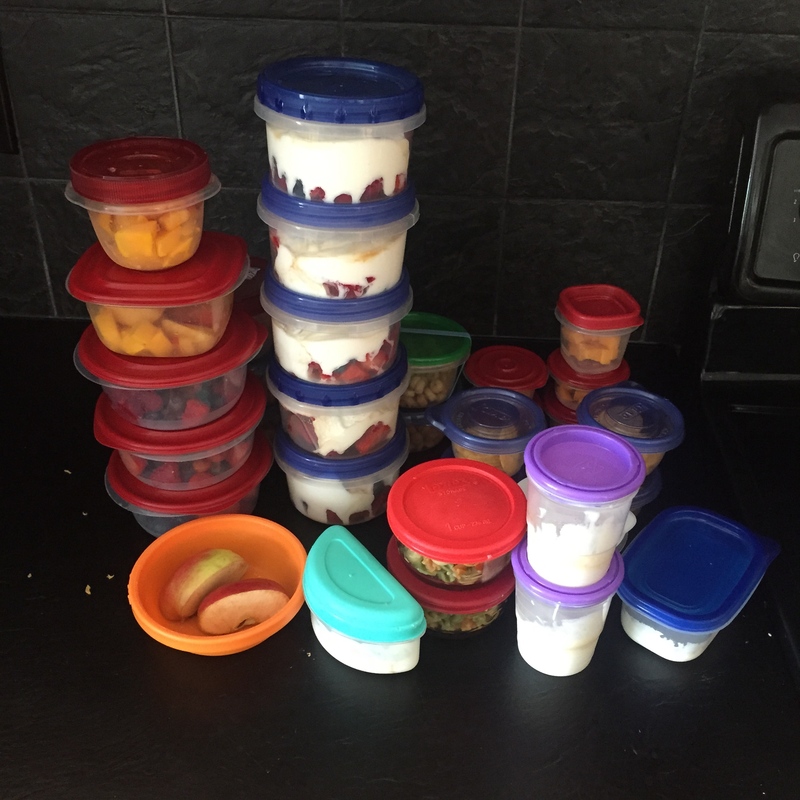 Everything was placed into individual containers, literally all I have to do is grab the containers and put them in our lunch bags each morning. 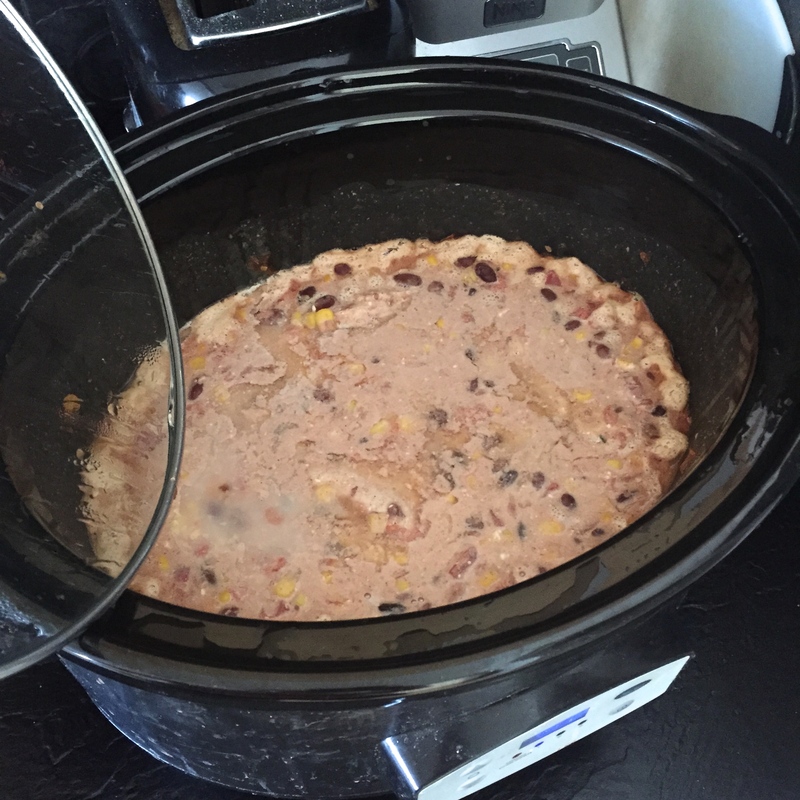 I’ve also decided I would plan 3 easy one pot and/or crockpot meals for our suppers each week and then just eat leftovers the other nights. My husband will cook Friday-Sunday normally anyways. That’s it! It’s been an absolutely life altering change to my routine and I’ll never go back. This week has been a dream! Every night this week Ezekiel and I have had over an hour of playtime together not including bath time and supper time. We’ve walked the neighbourhoods, we’ve read books and cuddled, we’ve put together puzzles, we’ve wandered outside and watered the garden (one of his favourite tasks). Having the one on one time with him where I’m not distracted by trying to finish up all my tasks has been amazing. Not only that but every evening this week I’ve had time to myself. I’ve been able to do whatever I feel like from 730 – 930 each night. I’ve read, I’ve browsed, I’ve watched and I’ve loved it. The last major thing it has changed is my energy every day. I’ve been asleep by 930 every night this week and up around 515 in the morning and I’m not struggling through my days. I’m awake and able to focus, I don’t feel like I’m on the verge of sickness every day and that is incredible. So this is me advocating that every person start food prep! It has completely changed my life, and I really think it would be a game changer for most people. I’ll document my process this Saturday and take you through step by step how I do it next week. Last year I was so fortunate to have had a great break through in my life in regards to food and nutrition. You can read more about that here. However, since going back to work I’ve been struggling far more than I expected. All the things I mentioned I was learning about? Ya, those are all still being learned and definitely reinforced. 2015 has not had an easy start when it comes to health for me. I’ve had strep throat twice, a couple colds and the stomach flu. On top of all of those things, I’ve just not been feeling great. Definitely not feeling anything like I felt last year at the peak of my nutrition breakthrough. I’m frequently feeling sluggish and a bit nauseous. I am far more liberal with my treats and exceptions. I eat way too much gluten and refined sugar, and drink far too many cups of coffee in a day. Generally I think I eat a diet that is closer to healthy than unhealthy. I still eat ample amounts of fresh produce, I still eat meat that is grass fed and finished and antibiotic free but my body has hit a point that’s telling me strict is better. As I sit and type this out I’m feeling exceptionally unwell and it’s a wake up call for me to stop being so liberal and get back to being more conservative with what I put in my mouth. It doesn’t help that it’s winter and I’m working full time so I’m not able to get out for a daily walk like I used to. Side-note: working momma’s who also find time to hit the gym or even just work out at home – you are my heroes! So it’s back to less treats and more fruit. It’s back to tracking my food and feeling well. It’s back to the simplicity of pure nutrition from real food. Less process and more nature. It’s back to making this a priority.